The 2016 MLB postseason will officially commence on Tuesday night, setting the stage for 10 hopeful teams in search of a World Series title. The Rangers and Cubs await the respective winners of the AL and NL wild-card games, while division winners in the Indians, Red Sox, Nationals and Dodgers begin play later this week. As the heavy favorite to win it all this season, the Cubs are unsurprisingly posting the strongest resale ticket demand during the LDS this postseason. As it stands now the average secondary market price for Cubs playoff tickets at Wrigley Field is $551.39, nearly double that of any other playoff team on their home field. Pending Wednesday's NL wild-card game, either the Mets or Giants will post the second most expensive average home price during the LDS. The wild-card winner will go on to face the Cubs, so either outcome on Wednesday will make it the most expensive first-round series this postseason. On the other end of the monetary spectrum, it will be the cheapest to attend games in Los Angeles, as Dodgers playoff tickets at home average $152.97 during their NLDS battle with the Nationals. The Rangers follow at an average resale price of $171 across all three potential home games at Globe Life Park. They'll play either the Blue Jays or Orioles depending on Tuesday's wild-card game outcome. The TicketIQ app is your go to source for updates on MLB playoff ticket prices + quantity drops. Download now and don't miss your chance to grab the best deals! Both matchups in the LCS have been set. The Kansas City Royals will take on the Toronto Blue Jays in the American League and there will be an unlikely matchup of the Chicago Cubs and New York Mets in the National League. The most recent World Series victory between those teams belongs to the Blue Jays in 1993. As the fan bases of each of the four remaining teams have been waiting extended periods of time for a championship, it’s no surprise ticket demand is high on the secondary market. 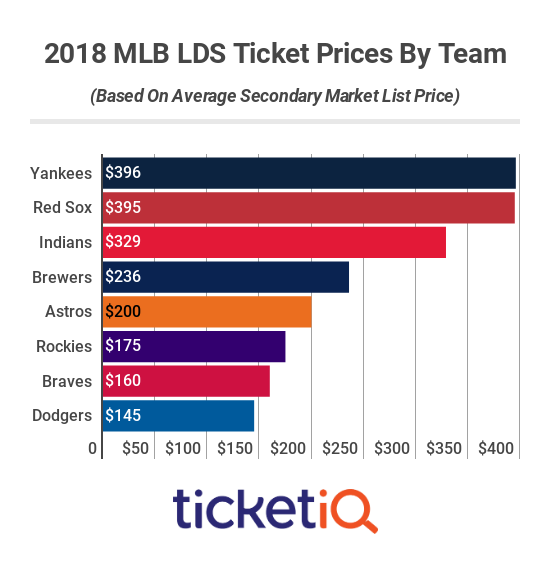 The meeting between the Cubs and the Mets is the most expensive LCS series TicketIQ has tracked since 2010, with Chicago and New York hold the first and second most expensive home ticket averages during that time. The Blue Jays and Royals have the sixth and seventh most expensive home averages since 2010, and combined make for the most expensive ALCS in that timeframe. With the Wild Card games over, and the Houston Astros and Chicago Cubs reigning victorious, the MLB Playoffs will now move to the League Divisional Series. Eight teams remain as the LDS is set to start on Thursday afternoon. On the secondary market, prices range greatly depending on the city and the games for the round. Teams like the Blue Jays, Mets and Cubs that have not seen postseason success in some time are drawing the highest ticket prices on the secondary market. In fact, the current Cubs average of $632.34 for their two possible home games is the most expensive LDS TicketIQ has tracked since 2010. Unsurprisingly Cubs tickets are the most expensive, though it is quite jarring by how much. While Blue Jays tickets come close to a $400 average, playoff tickets at Wrigley Field have easily cleared $600. However, the Cubs were close to not hosting a home NLDS game. While the Cubs dominate the secondary market for playoff tickets, they were not the No. 1 team in the regular season. That was the Blue Jays, who surged past the Yankees and will likely claim the AL East. Blue Jays tickets averaged over $90 during the regular season, the only team of the current playoff field to do so. Only Cubs and Mets tickets were above $80. The Cubs are not the only team to hold a high home average for LDS games this year. Four of the five most expensive home average ticket prices come in this postseason. The Cubs are followed by the Mets, who beat out last year’s Royals, another club that had gone an extended period of time without postseason success. Rounding out the top five are the Blue Jays and Cardinals this year. St. Louis is the exception to the playoff drought, but prices have increased since Chicago became its first round opponent. Below is a look at MLB playoff tickets, and prices for each team for each round. Check back throughout October for updated pricing. Here at TicketIQ, we wanted to see if there was a correlation between team's playoff chances and their average secondary market ticket prices throughout the month of September, below is a chart showing what we found. As you can see, there is some correlation. Teams like the Dodgers, Red Sox, Braves Pirates and Tigers, whose playoff destinies are set, have see prices dip as September has rolled on. Dodgers tickets, for example, have dropped 21.23% since earlier in the month. Over in Boston, fans are still pouring into Fenway Park, but even they've seen a 4.88% drop in the price of Red Sox tickets this month. The Royals, who chances have got slimmer and slimmer this month have also seen a price drop. Then you have the Indians, who have also seen their prices drop despite improving their playoff chances dramatically. Then you have the Yankees, a team whose playoff chances are nearly dead, but with a ticket price that has gone up 28.76%, the most for any team we tracked. Clearly, Mariano Rivera's retirement is driving up demand and bringing fans to the stadium so that they can see Mo one last time.